Born in Trenton, New Jersey, Carol Sirak, a largely self-taught artist, spent much of his free time watching over the shoulders of the New Hope masters. Having an avid interest in art from childhood, Sirak dabbled with painting for most of his life. He was employed by the Roebling Company in Trenton, the firm that designed the Brooklyn Bridge. A man of modest means raising a family during the Depression, Sirak had little time and money to afford his artistic training. He would have to rely on trips to nearby New Hope during his time off to learn painting from observation. 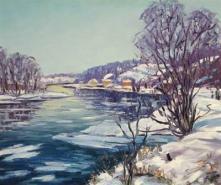 It is said that Edward Redfield would welcome visits to his studio by Sirak and this influence is apparent in Sirak's painting. A complete unknown to the art world ten years ago, the paintings of Carol Sirak were discovered and only recently has his name been brought to light. He taught art classes at Rider College and the Trenton Art Institute.